Today two toasted sandwiches: Thai style Tuna, which turned out to be not as good as the Sweet & Spicy Tuna we normally get, with Avocado, and a Roast Turkey Breast and Avocado. No cheese in today’s sandwiches! Both decent sandwiches for $2.95 per serve. 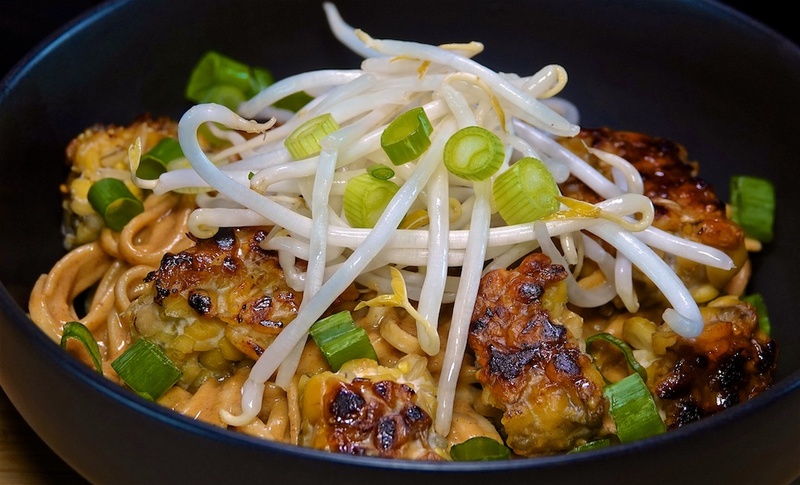 Foodie Greg has been looking for a reason to test a Tempeh recipe for a while and decided on Peanutty Noodles with Temeh Crumbles. Although nominally for four, we finished most of the recipe. Add 50c for oil and seasoning. While the peanut sauce had a different flavor profile than the one we enjoy with steak or eggplant, it was still very tasty but without the funkiness that Fish Sauce brings. The Tempeh had a good nutty flavor and a texture that added a meaty toothiness to the dish, which went well with the peanut sauces. A good dish for $2.40 per serve. Because it’s Sunday we took a little more time with lunch and had Trader Joe’s Giant Baked Beans, Spinach and Feta Sausages and a Fried Egg. The sausages were $5.00 for the pack or $2.50 per serve. A hearty lunch for $4.27 per serve. Add 30c for heavy cream. 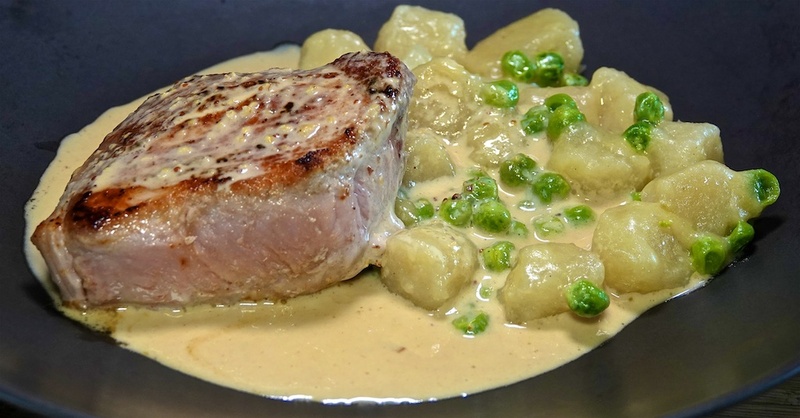 The gnocchi and mustardy cream sauce worked well together and paired with perfectly cooked pork it was a great meal for $7.35 per serve. After the trip back from San Diego we picked up a Bahn Mi from our favorite local Vietnamese restaurant for $8.27 per serve with tax. 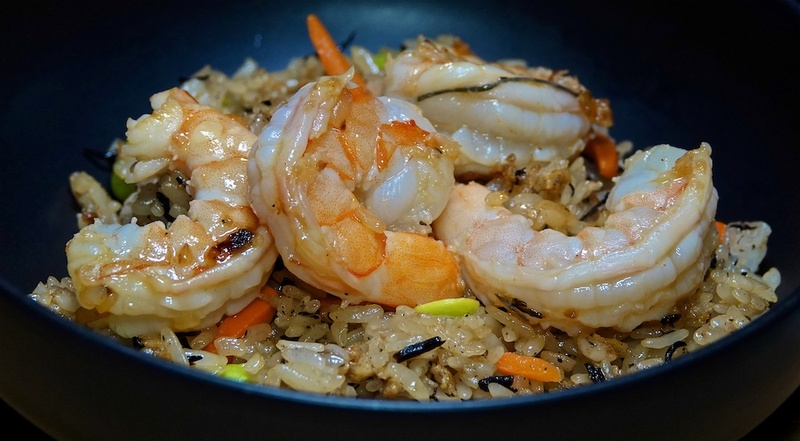 Having missed “Fishy Friday” yesterday, we substituted tonight with Trader Joe’s Japanese Style Fried Rice and some frozen shrimp that we stir-fried and placed on top of the fried rice. The shrimp were $7.99 but we shared half or $2.00 per serve. A simple, but very tasty meal for $3.48 per serve. The Japanese Style Fried Rice was pretty good, but could use a little flavor boost. The Foodies finally finished NAB by traveling to San Diego to return some gear used on the OWC Radio stand to our friend Cirina, who had a fresh baguette, an array of salamis, Brussel Sprout salad, and a cheesy past a salad, which we thoroughly enjoyed. 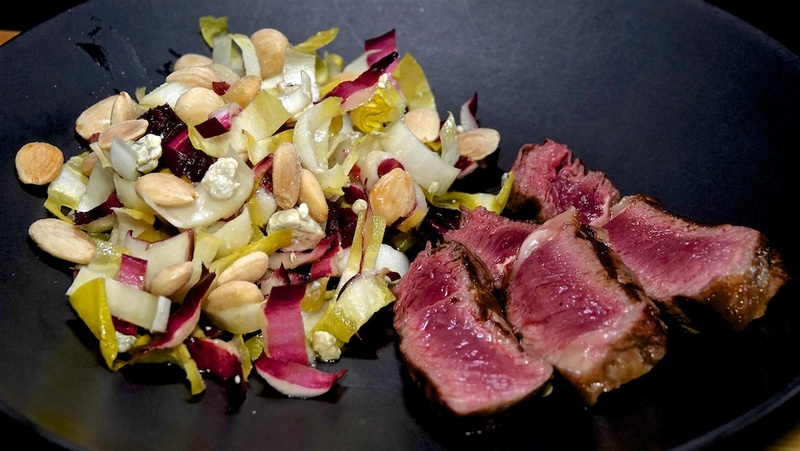 That evening Cirina cooked up a chuck roast in her Instapot and it was ready to pull apart in just over an hour. Potatoes were cooked separately for better flavor. 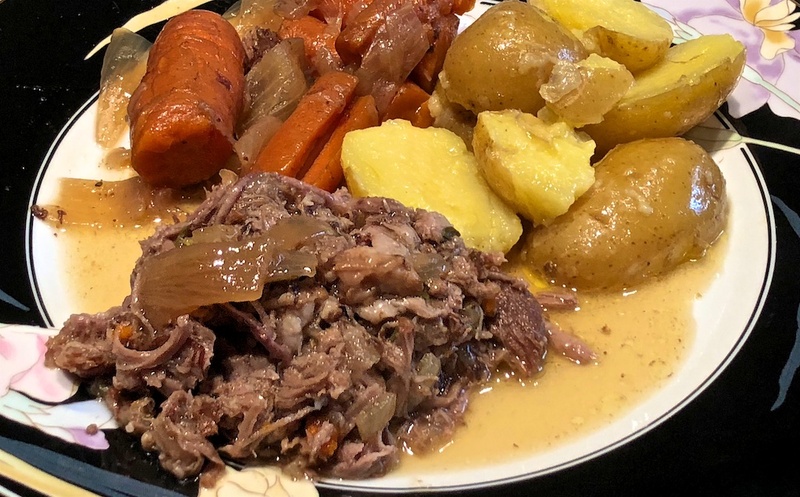 Overall it was a very tasty and successful pot roast. For lunch we had the remaining pieces of the Asparagus and Ham Frittata cold for $2.25 a serve. 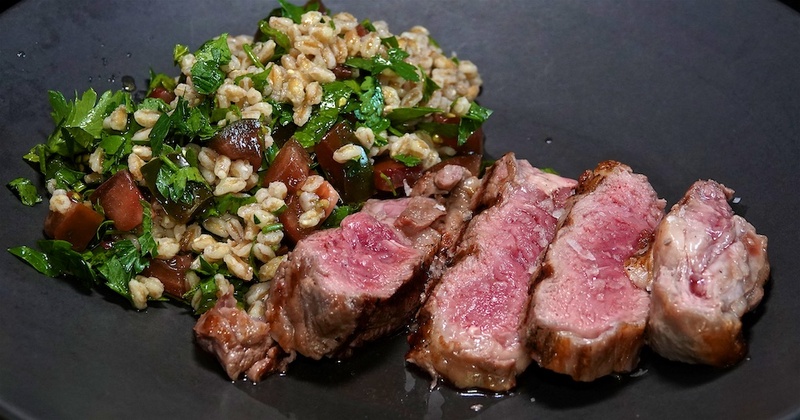 Thursday night “Steak Night” tonight featured a grilled Rib Eye with Farro Tabbouleh. Mint came from our garden. The steak was perfectly cooked and the salad provided a very good complement for $9.02 per serve. For lunch we, once again, finished the par baked panini roll and stuffed it with egg salad and watercress. The watercress cost $1.99 and we shared about 1/8 or 12c per serve. We enjoyed this roll a lot for $1.67 per serve. 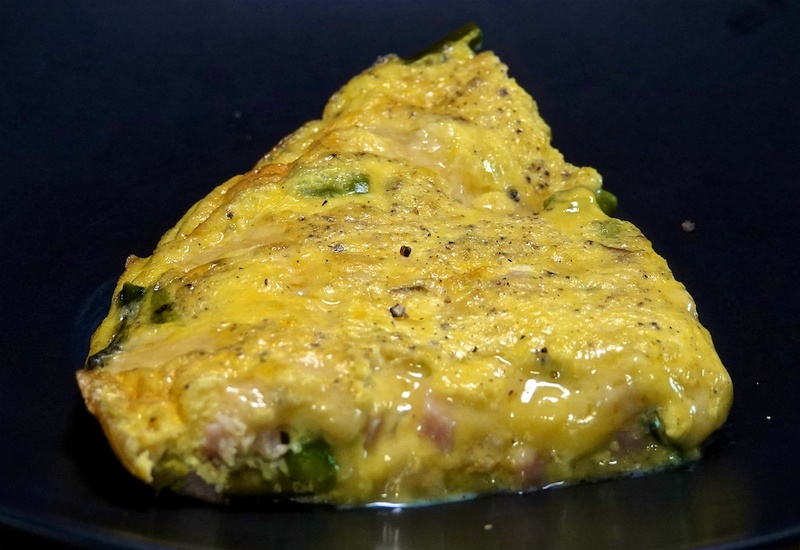 Another way to use ham is in an Asparagus and Ham Frittata! We precooked the asparagus in the panini press, mixed in a generous amount of finely diced ham and cooked. We will get four serves. This turned out particularly well for just $2.25 per serve. A mid-morning trip to Whole Foods provided an opportunity to pick up some spicy tuna rolls, and a black rice avocado and cucumber roll. In total, the sushi was $17.98 or $8.99 per serve. Tonight we tried a Beef Stir-Fry recipe from Whole Foods (pure co-incidence) that we used sliced top sirloin for the meat, and augmented it with carrots and the remaining box choy. This recipe was terribly bland. 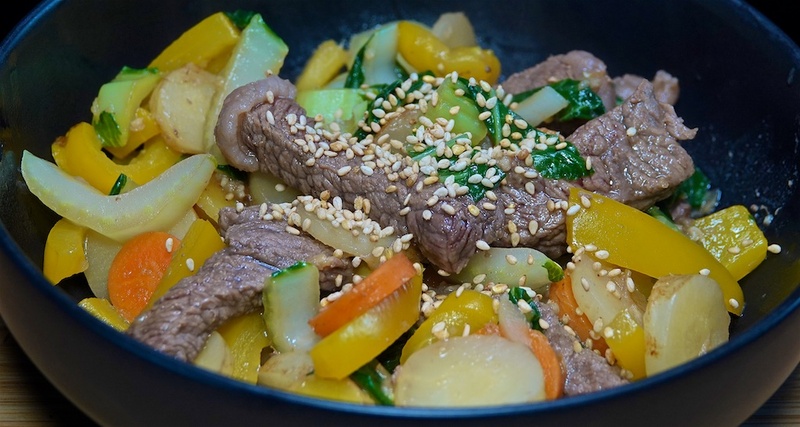 It is not a stir fry recipe at all, given that the meat stews in the liquid and the vegetables effectively steam. We added a little fish sauce after serving to bring some flavor to the dish. Disappointing for $6.15 per serve. Since we have so much ham, we riffed on a Reuben by substituting ham for pastrami and mustard for Russian dressing. Add 40c for butter and mustard. Ham makes a fine substitute for pastrami, although this is its own quite good flavor combination for $1.79 per serve. 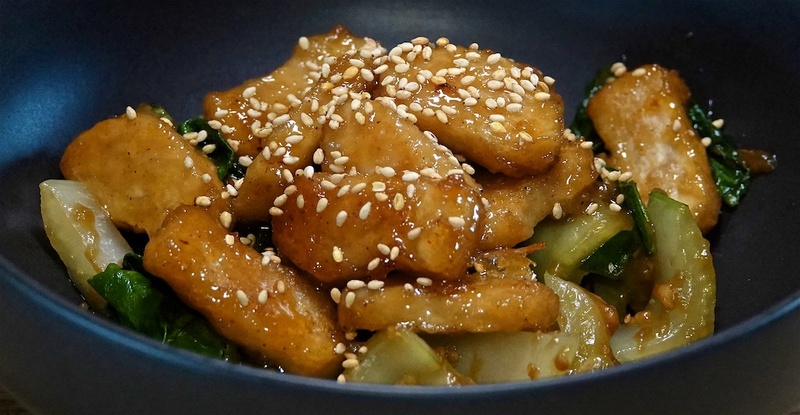 For out “meatless Mondays” we are exploring meat substitutes like Trader Joe’s Chickenless Mandarin Chicken Morsels, which we served with an Asian style Stir Fried Bok Choy. Add 30c for dressing ingredients. We were not impressed with the Mandarin Chicken Morsels, not because if wasn’t real meat, but because the breading stuck and added no flavor, we won’t be buying them again. There are other meat alternatives to explore. Still this wasn’t a terrible meal for $2.23 per serve. For lunch we heated the remaining Popeye’s Fried Chicken and served it with a Spicy Pepper and Corn Salad from Ralph’s. A 10 piece special was $13.98 and we had two piece each, or $2.80 per serve. A nice lunch for $5.00 per serve. Easter is one of the few times a year when Leg Ham comes on “loss leader” special, so we always take advantage of it. Today we baked it and served with Choucroute. Add 20c for sherry and other ingredients. 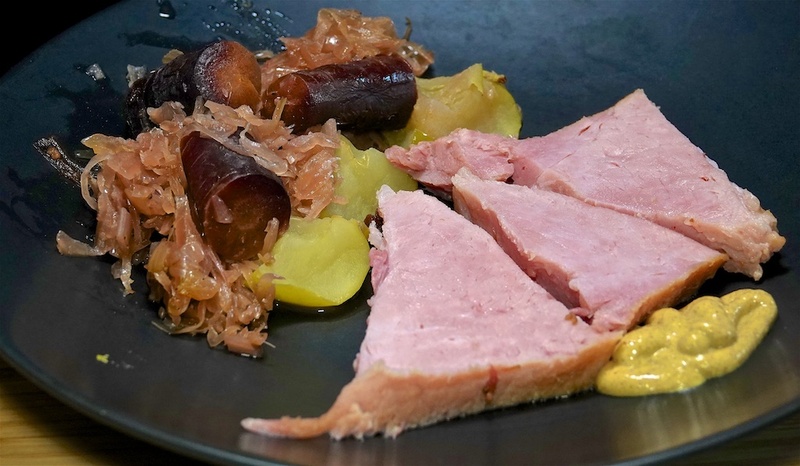 The ham turned out particularly well as did the choucroute. We enjoyed both for $3.06 per serve. For lunch we finished the par baked panini roll and stuffed it with egg salad and watercress. Add 30c for apple cider vinegar and oil for the dressing. A great meal for $10.94 per serve.